In the Filipino Culture, the Christmas Season isn't done yet. But after the Noche Buena, just a week later, there comes another almost equally big celebration here in the Philippines. It is the celebration of New Year's eve. Some say Christmas is for kids, and New Year is for adults, and there's some truth in that. Children benefit the most in Christmas, but it is the adults that enjoy a lot more upon the entry of the next year. 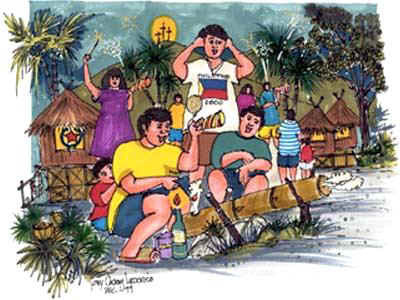 Read on if you're in the Philippines and making your New Year Pinoy Style. It helps to take a look at some need-to-knows. Noisemakers. These Chinese inventions had gone a long way. Brought by traders from China and a very cool addition to our tradition, a lot of noise is being made at the stroke of midnight to bid the old year goodbye and welcome the upcoming year. Some also say to drive off bad luck, but I'd rather stick to the first reason. 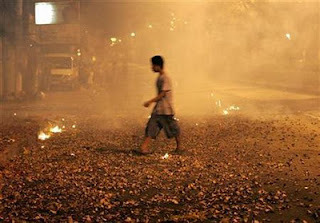 For many Filipinos, it is a must to make something burn, explode and make a lot of noise on the evening of December 31. Every Pinoy knows Bulacan produces these "paputok" and almost all supplies of these comes from the province. Beware though because not all being sold are legal. 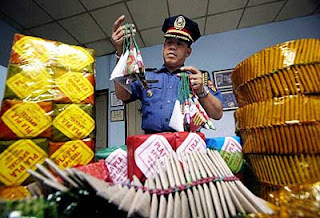 But as they say, the bigger the better, so a black market for oversized firecrackers still exists. As for classic buys, you'll never go wrong with fountains, lucis, sparklers, roman candles, trumpillo and other colorful stuff that don't make noises. In the Philippines of old, a bamboo cannon is the way to make noises on New Year's Eve. For the more adventurous Filipino, the 5 star, Super Lolo, kwitis, "sawa," and other noise makers can give you the adrenaline rush you need. Just remember that after handling these firecrackers, wash hands with soap and water to avoid poisoning. Any injury sustained through accidental contact with firecrackers should be treated in a hospital whether its a small scratch or a blown-off hand. You don't want to end up with a nasty infection or a bad case of tetanus, right? "Putukan." Even before midnight, countless firecrackers have been lit. At 10pm or a bit later, there is a temporary slowdown of exploding firecrackers as most families would go hear mass or cram up some dishes for the medya noche. As midnight draws near, it gets noisier and noisier until finally, the new year comes and all the "paputok" gets lit. Everywhere it is noisy and full of smoke. It would be wise to cover noses with a handkerchief or a mask, but you would look really weird so might as well forget about it. Be careful going too near a "sinturon ni Hudas" or "sawa" as they might shoot you a piece of it about to explode and get caught in its rupture. There is no safe distance actually so just play it by luck. Never pick up any firecracker that didn't explode, it might go off on your hand. Don't bother making faulty firecrackers work, as this is the one of the top causes of injury. When lighting something that explodes or make a lot of light, better use a long stick with a piece of lighted "katol" tied on one end. Forget about lighting one in your hand and throwing it off before it explodes. Sometimes the firecracker is faster than your reflexes. You can find that out without loosing your fingers. Stray Bullets. This is a real danger in the celebration of New Year's eve. Year after year, many individuals still end up getting hit by bullets discharged in the air while the revelries are happening. Despite precautions and prevention of indiscriminate firing of guns in the air during New Year, a lot still get injured. 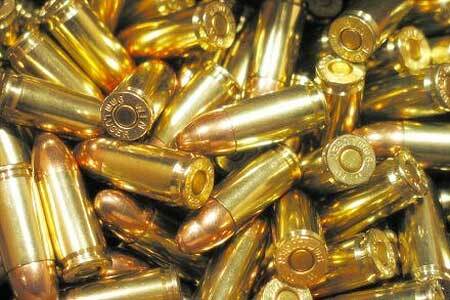 A bullet fired in the air, theoretically, has less power when returning to the ground. Theoretically too, its chance of hitting someone is pretty rare, but people still get hit despite the odds. To keep yourself safe, either stay on the ground level of a house that has a concrete flooring on the 2nd floor or move around a lot. You have a higher chances of getting hit by a stray bullet when stationary rather than moving around. Drinking. 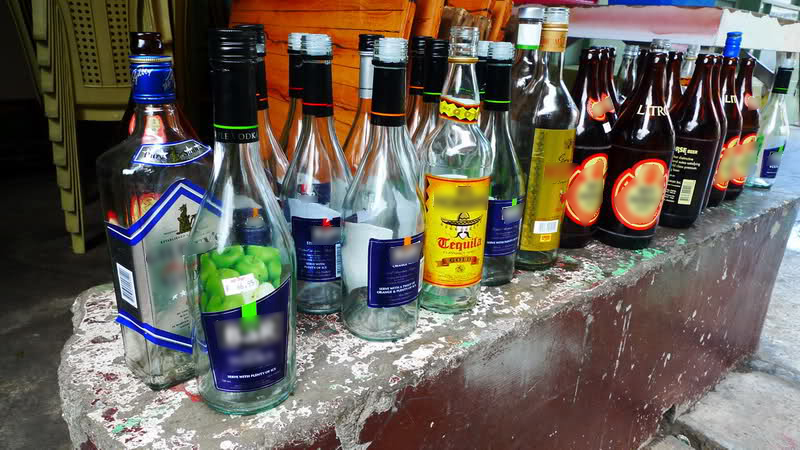 A lot of Filipinos love to get drunk on every occasion. Why medya noche is different? It isn't really. But since 90% of friends and relatives are on vacation during this time, all the more getting wasted is a lot fun. 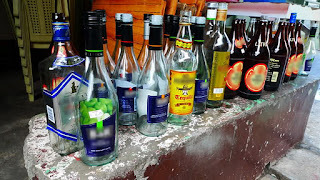 Add to the equation we have a little extra for alcohol, you might find sari-sari stores running out of beer or liquor to sell. The way to do this, stock up alcoholic stuff and ice so you don't run out of such. Days like New Year's eve are rare so might as well enjoy it completely. Just remember, NEVER drink and drive whether you're riding a car, motorbike, bicycle or anything that has wheels. Round Fruits. Here's a Filipino tradition that bothers me a lot. Not because its strange or because it came from the Chinese. 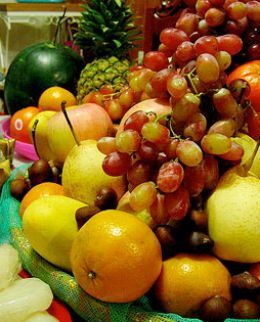 Its quite annoying to follow because one has to find at least 7 types of fruits that are round for prosperity's sake. Who the hell is prosperity? :) All I know is that the only ones who prosper are the ones who sell round fruits before the year ends. Because of such a high demand, their prices make a sudden jump at the eve of New Year. Believe me when one time I bought some fruits and I felt "harapang ninanakawan." Nevertheless, though I felt really bad spending so much for fruits, those are going to be great help for people who'd have hangover next morning. When choosing fruits, make sure you buy what can be consumed in the next 2-3 days. Classic ones are apples, oranges, ponkan, dalandan, pomelo (oranges, ponkan, dalandan and pomelo are considered different from each other so go ahead), lychees, longan, grapes, buko, pineapple, etc. etc. etc. There'd always be rounded fruits out there so worry not when looking for such. Don't buy tomatoes though. Yeah, they're rounded and a fruit of a tomato plant, but we Filipinos still consider it a vegetable so it doesn't count. But if you insist, of course you can, I won't stop you. Polka Dots. 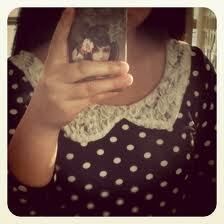 Wear something that has rounded designs when welcoming the New Year, many people say. These signify, again, prosperity. They say rounded designs represent coins and money which will be present throughout the year for the wearer. A common practice also is filling pockets with money because its bad to start the year without money on your pockets. But what I tell people to do is wear rectangles on New Year's eve. Circles represent coins, but there are no 500 peso or 1,000 peso coins. They only exist in bills, and paper bills are rectangular in shape. Now do you want coins or do you want paper bills? These are just on top of mind at this very moment that I am writing. Like most Pinoys nowadays, we've got so much to do with so little time. Its as if the Holidays weren't enough for us. New Year practices and traditions is a great part of our culture and describes a lot about the Philippines. As with all the stuff I wrote about here, I hope Filipinos will try to keep these traditions alive so that the succeeding generations will still enjoy what we have experienced in our lifetime.